TRBO LinkTM is an IP-based networking gateway, designed to enhance wide-area system capabilities and to provide interoperability functionality between MOTOTRBOTM and non-MOTOTRBOTM systems (for example, analog and P25) systems in commercial (business and public safety) systems. TRBO LinkTM gateways connect into IP Site Connect (IPSC) systems through IP network connections (private or internet). Whereas IPSC systems are limited to a maximum of 15 repeaters in one network, TRBO LinkTM gateways can be used to expand IPSC systems into very large systems, with hundreds of repeaters connected if needed. They also allow for dynamic bridging between repeaters or groups of repeaters and between time slots, based on talkgroup ID codes or pre-programmed "patches". TRBO LinkTM systems handle voice (group, private and All Call), GPS and ARS data, text messaging, Call Alert, Radio Query, Radio Enable/Disable and Emergency Call. This allows for a wide range of flexibility in the operation of an IPSC system. For example, Emergency Calls and All Calls can be transmitted on one time slot, but be received on both time slots. Analog interfaces are available to tie into the accessory ports on repeaters, base stations, control stations or analog dispatch consoles, providing interoperability between MOTOTRBOTM systems and conventional analog, P25 conventional or trunking or other non-MOTOTRBOTM systems. TRBO DispatchTM is a PC-based Radio Dispatch Client software application and allows for computer workstation voice dispatching and manual remote bridging control. 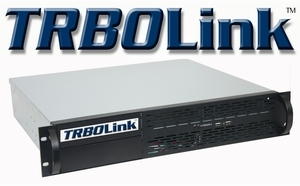 TRBO DispatchTM connects directly into a MOTOTRBOTM system, through an IP network connection (private or internet) to a TRBO LinkTM controller. No control station radios are needed. More information about the TRBO LinkTM can be found Here in our Library section.